I use masking tape on a lot of my work to mask out slip areas. Each side of the mug is different from the opposite side, and all the mugs are different from one another. 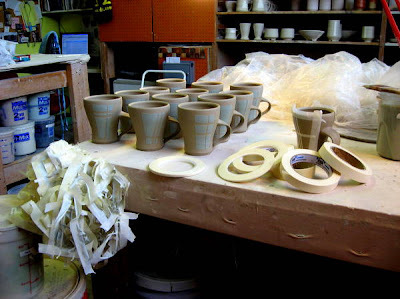 You can see the mess of masking tape that is sticking to my table after I’ve finished up with a baker’s dozen of mugs. (A mess… but a satisfying mess.) I was excited to find masking tape in about 6 different widths last week. Oh the possibilities! I’ll post pictures of the finished mugs after next week’s firing! Hopefully there will be a bunch of goodies to show you (and maybe finally some pots will be up on my Etsy page!). Have a good firing Emily, look forward to seeing the mugs and all the other pots too! Hi Emily, excellent news about the etsy shop, woohoo.. do you have any kiln photos? I can’t figure out about the masking tape, but it look interesting. Can’t wait to see how the mugs turn out and then maybe I can figure it out. Looking forward to the bigger pieces too. The mugs look interesting. It’ll be fun to see the pics after firing! Thanks for giving us a preview of exciting things to come! I’ll post new ones at the end of next week after this next firing! Emily, where did you find the masking tape in various widths? I’ve looked for that a lot without success. The mugs look great! At an art supply store. brilliant shot emily thanks for that, It looks like a similar configuration to the gas kiln we’re building at the mo, and a very nice firing to..